Skaters Café is open daily for tasty meals, snacks and refreshments. The café is the perfect setting for children’s and Christmas parties. Private Lesson by arrangement – please call Jill on 07742 044734 for details. You can pre-book on-line online to guarantee your place or buy your tickets from the box office when you arrive. 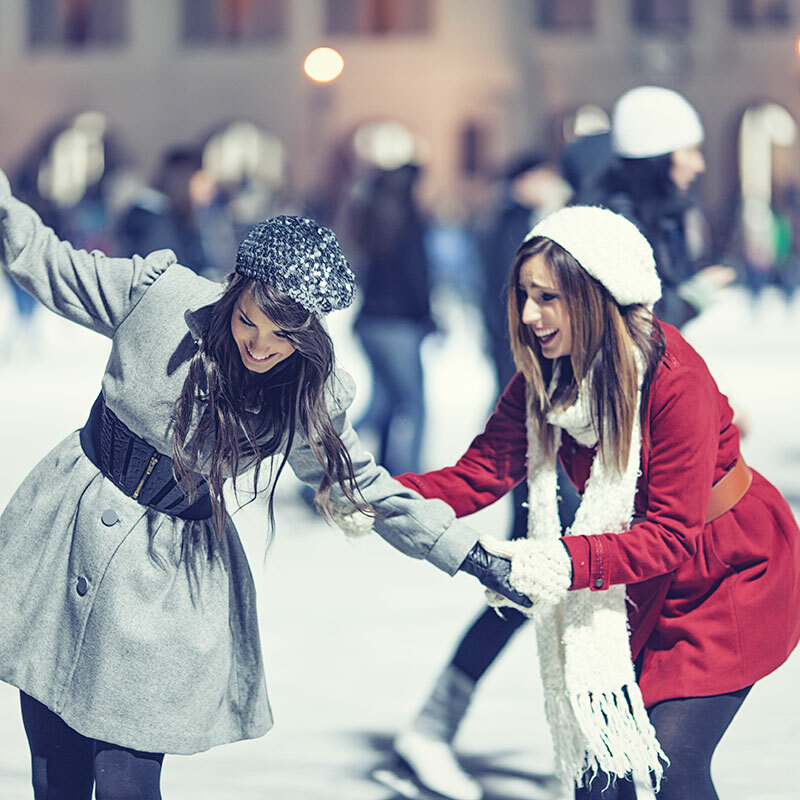 Remember, you may have to wait for your turn on the ice if you haven’t booked your session in advance, especially during peak times. Go to the cash desk with your e-ticket and we’ll scan you in – no need to print your ticket we can scan your ticket straight from your phone. If you forget your ticket we can look you up – just be prepared to be asked for some ID. We recommend Warm, waterproof outdoor clothing, remember you may get wet if you fall over. Long socks, gloves and hats. Wear thin layers under a jumper or coat. Hoodies must not be worn up on the ice. Please make sure scarves and loose clothes are tucked in. There is metered parking all around Steyne Gardens, on road parking is free on Sundays. The nearest multi-story is a two minute walk at the Guildbourne Centre between Ann Street and Chatsworth Road. We ask that skaters are aged four and upwards. Our smallest skates are childs size 8. Safety helmets are available free of charge on request. Children under the age of 8 years must be accompanied on the ice by an adult. our fun as Worthing Ice Rink is under a huge marquee. Brilliant fun! friendly and helpful, nothing was too much trouble. For further information on lessons, children’s parties, any questions which are not covered on this site or any special requirements please let us know and we will do our very best to answer your queries.